The Greek islands are places with long history that starts even from the prehistoric times. Due to their special geographical location, they were largely influenced by many civilizations of the Mediterranean Sea and developed unique cultures of their own. Some of these cultures left their marks evident until today with archaeological sites and interesting ruins. 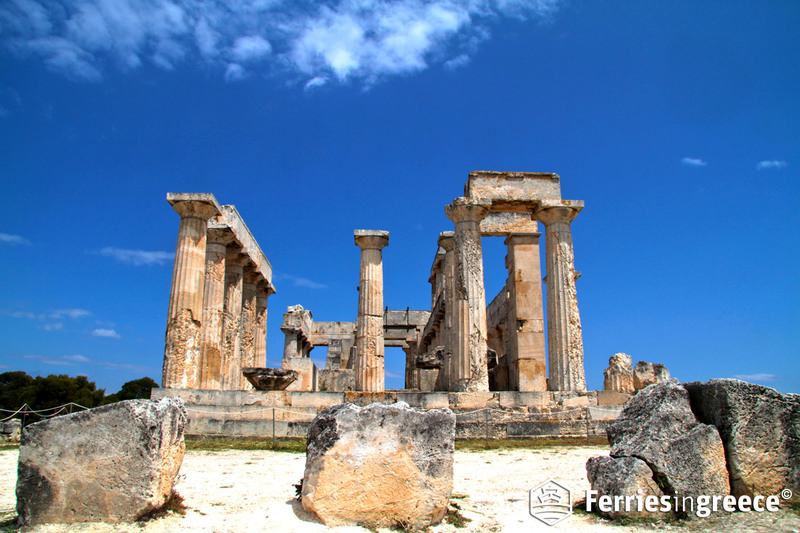 You can access the islands by ferry and enjoy the famous ancient sites. Crete is a large island with rich history, from the ancient times until today. The peak of the Cretan history is the Minoan period, when the island became rich due to trade and developed many cities with interesting urban structure. The most important Minoan site in Crete is the Palace of Knossos, located very close to the town of Heraklion, on the northern side of the island. 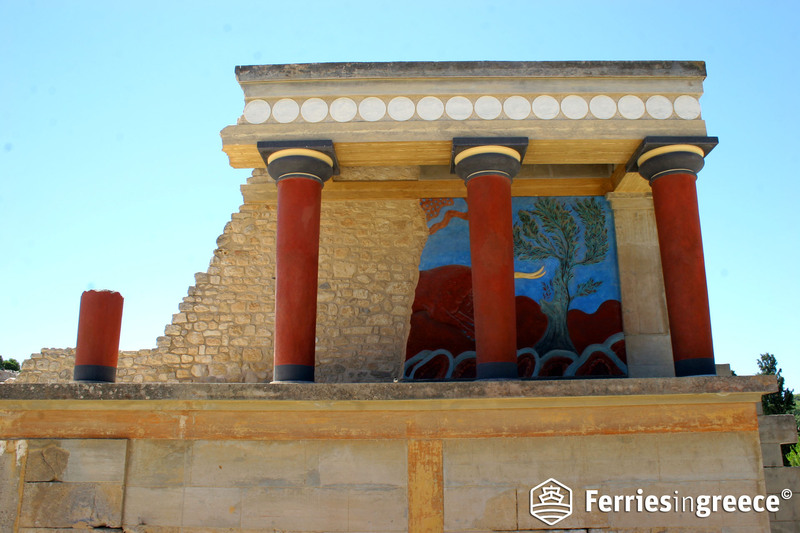 Knossos Palace is famous for its colorful frescoes that depict scenes from daily life and festivities of the era. A very interesting fact about Knossos is that the entire town was destroyed due to large tsunami waves that the strong earthquake of Thira (Santorini) caused around 1,500 BC. In fact, the town remained almost intact until its excavation as it was covered by volcanic ashes during all these centuries. Another important ancient site from the Minoan times in Crete is the Minoan Palace of Phaestos, located on the southern side of the island, where the famous Disk of Phaestos was discovered. Among the top Greek islands with famous ancient sites to visit, we could not miss the island of Santorini. 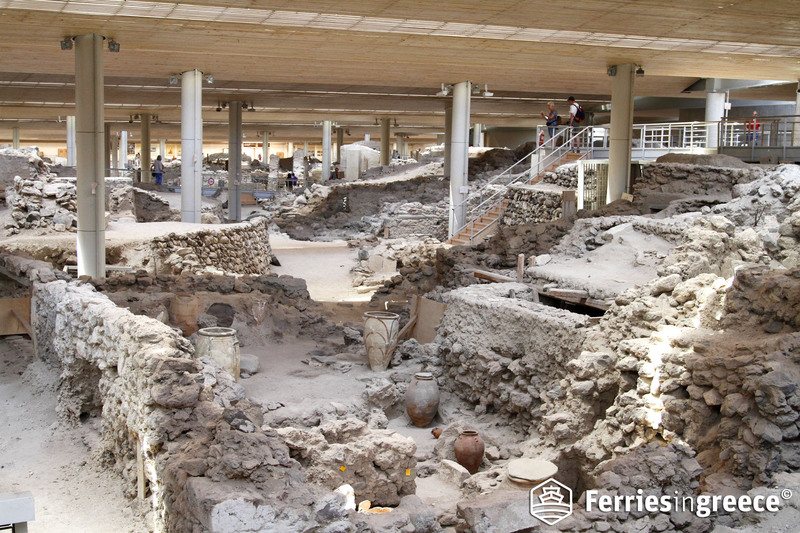 The most famous archaeological site to visit in Santorini is the Minoan Town of Akrotiri, excavated under tones of volcanic ash. This is why archaeologists believe that the town was destroyed when it got covered by the lava from the volcanic eruption of Santorini. After it remained closed for many years due to an accident in 2005, the site reopened in 2012. Being in the center of the Aegean, ferries from Santorini also travel to other Cyclades including Milos, Ios and Naxos. Although Rhodes is mostly famous for its Medieval history, it had also developed a rich history in the ancient times. 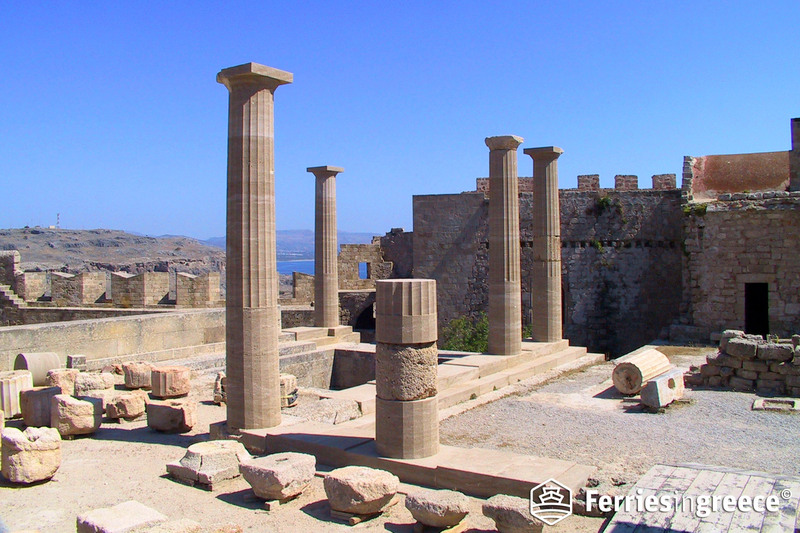 The four main ancient towns on the island (Rhodes, Lindos, Kameiros and Ialyssos) have left interesting sites to visit. One of the most important ancient sites in Rhodes is the Acropolis of Lindos, constructed on top of a large hill and offering breathtaking view to the sea. Other interesting sites are the Acropolis of Rhodes Town, just outside the modern town, and Ancient Kameiros. 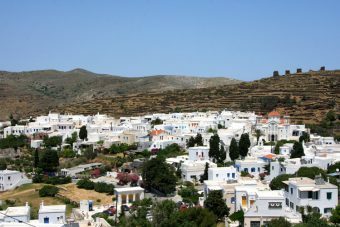 Rhodes also offers many ferry connections to interesting nearby islands such as Halki, Tilos, Kos and the famous Symi. Although Lemnos is a secluded place, accessible by plane or ferry from Lavrion port or Kavala, it can easily be included among the best Greek islands with famous ancient sites. 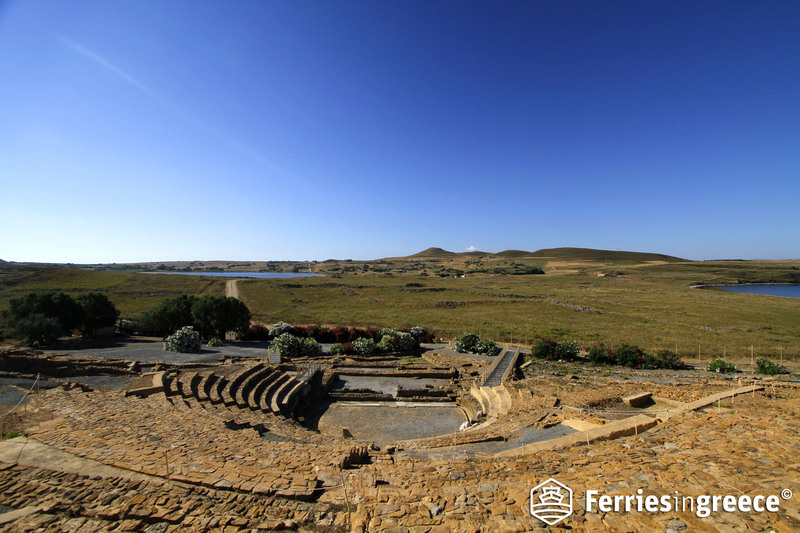 Since the ancient times, Lemnos had a strong presence in the Greek mythology and history. The most important site in Lemnos today is Ancient Poliochni, dating from the 3rd millennium BC and considered the oldest settlement in Europe. Very interesting are also Ancient Kavirio, a sanctuary connected with mystic ceremonies, and Ancient Ifestia, dedicated to god Hephaestus who was said to be born in Lemnos. Accessible in 30 min by ferry from the port of Piraeus in Athens, Aegina had a strong political presence in the antiquity. The most important ancient site in Aegina is the Temple of Aphaia, constructed in the 5th century BC and dedicated to goddess Athena. This temple is considered a wonder of classical Greek architecture, almost comparable to the Parthenon of Athens. It is located on the eastern side of the island, close to the tourist place of Agia Marina. Want to book to Greek ferries to the islands? 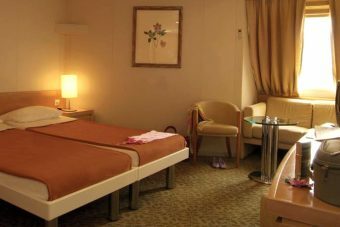 Check our Online booking engine!